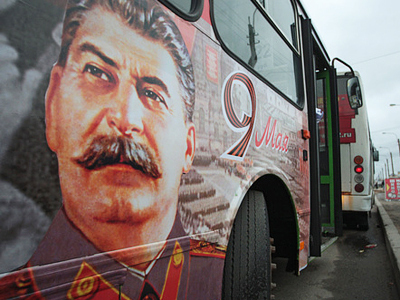 Public buses with the image of Soviet leader Joseph Stalin, known as Stalinobuses, will hit the streets of about 40 cities across the former USSR on the eve of celebrations marking the defeat of Nazi Germany on May 9. Launched in St. Petersburg in 2010, the Victory Bus campaign is being held for a third year running, once again stirring up controversy and angering rights activists and ordinary Russians. According to the head of the project Viktor Loginov, this year a record number of cities in Russia, Ukraine, Latvia, Estonia and Belarus are going to take part. “The final chord and good news for all of us, is that the Belarusian capital Minsk’s joining the project,” he wrote in his blog. Belarus, along with central areas of Russia and Ukraine, was harmed more than any other part of the USSR by the Nazi invasion, Loginov pointed out. The project is a private initiative, financed by money collected on the internet. 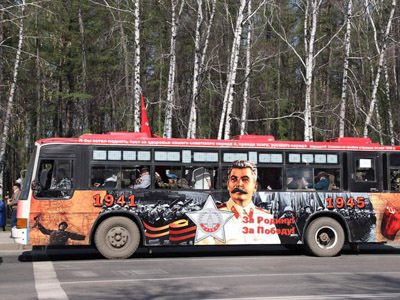 According to the Victory Bus website, it costs around 20,000 roubles (about US $670) to decorate a vehicle with images of Stalin or his famous quotes in the regions, and over US $3,000 – in Moscow. The organizers stress that their project has nothing to do with politics and certainly cannot be interpreted as a provocation. “Our only goals are the restoration of historic truth, bringing back an unbiased view of history… and congratulating [World War Two] veterans on the anniversary of the great victory of a great country, which was led by Joseph Stalin in that harsh, stormy period of time,” they state. However, the head of the Kremlin’s Human Rights Council, Mikhail Fedotov believes Stalinobuses rolling through Russian cities is very much a provocation. “We have much to be proud of, including our victory in World War Two. We can find a lot of ways to immortalize the memory of our heroes. Stalin is a figure that causes confrontation in society, and there is no need to spark that. It’s harmful,” he told Interfax. 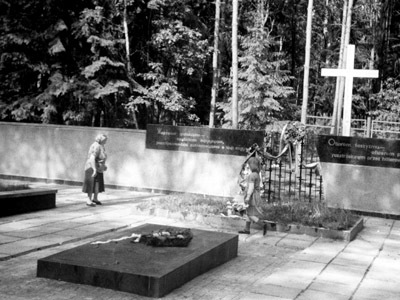 Leading Russian rights organization Memorial is also against the initiative, which it says only serves the purpose of those who want to make Russia an outcast. 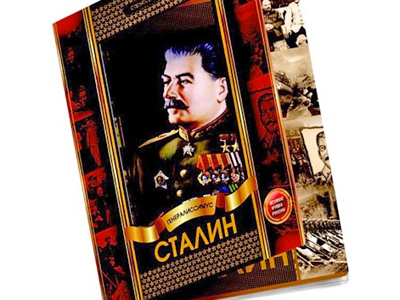 “The propaganda of Stalin’s image today is a disgrace for the country, evidence that this country remembers nothing. It discredits Russia,” head of the board of Memorial Arseny Roginsky said. Meanwhile, the initiative has already created a scandal in Ekaterinburg, where Stalin’s image was reportedly removed from a bus after representatives of the Chechen community voiced their discontent. The Chechen republic’s representative in the Urals region, Salaudin Mamakov told New Region news agency on Thursday that local Chechens are planning to file an appeal to the prosecutor’s office and rights ombudsmen. He pointed out that many Chechens fell victim to Stalin’s repression. 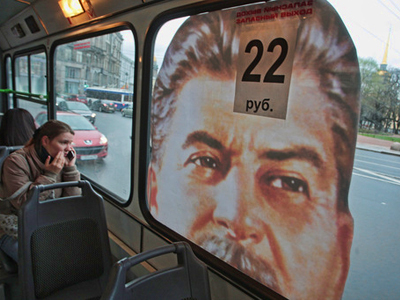 Launching buses bearing images of the Soviet dictator stirs up interethnic hatred and displays “disrespect towards nations deported” during the Stalin era, Mamakov believes. In the course of World War Two, about a dozen peoples, including the entire Chechen nation and their Ingush neighbors, were deported on Stalin’s orders from the USSR’s western regions to Siberia and Central Asia. The Soviet leader accused them of collaborating with the invading Nazi troops.